Top Daily Fantasy was created by a team of Daily Fantasy Players passionate about getting new players involved and current players informed on everything DFS. When we first started playing Daily Fantasy Sports we were instantly hooked and we couldn’t help but share our excitement and fun with our friends and family. We helped them get started and they started to play and enjoy playing tournaments as well. We loved spreading the word and we enjoyed the fact that we made sure everyone knew what they were getting into and had the best promo codes so that everything was lined up for them to win money and have success playing DFS. 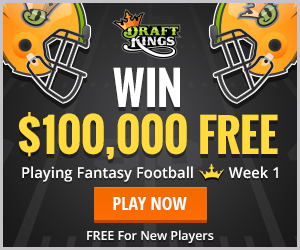 We wanted to do the same for more people so we created Top Daily Fantasy. We hope the honest information we provide helps you become more successful, whether you are just starting out or you’re already playing just looking for new promos and news. If there’s anything else we can do to help you out, feel free to email us or send us a tweet.